I’m Too Big for My Britches! In most cases, your plants will need to be transplanted into larger pots weeks before they can be planted into the garden. A pot-bound plant will stunt and take longer to recover once outside. A series of 4″ pots (which can still fit into the same trays as the cell trays) are usually large enough. Pick up the seedlings to be transplanted by the root ball or the leaves (if they are very small) – not the stem, which can crush. Place the seedling in the bottom of the empty 4″ pot, pinch off any leaves that are below the top rim of the new pot and cover the entire stem with soil-less mix (you can use the seed starting mix if you have some remaining). Water the soil and add more as needed to fill the pot. Those little hairs on the stem will turn into new roots and give you much stronger plants. Follow the same guidelines for hours of light, fertilizer and water with the 4″ pots as with the seed trays until the time is right to plant them in the garden. I’m Tough! Well Maybe Not So Much . . . Even with all the care and “training” your plants have received, Mother Nature can be very hard on them. Preparing them to go into the garden is called Hardening-Off and takes about a week. The process is a schedule and each step can be one day or a few days for each step. First day(s) – bring your young tomato plants outside and place them in full shade during the day, but bring them back inside at night. Next step is a few hours in the sun – early morning or late afternoon, move them into the shade during the hottest part of the day and then inside at night. The next step is all day (approx. 8 hours) in the sun and covered with an old bed sheet or a floating row cover such as ReeMay at night. Next step – all day in the sun and stay out over night uncovered. Because of the exposure to direct sun, wind or lower humidity, the plants will need more water than they required during their final week inside. If there is any frost warning, make sure to bring your plants in early. Into The Warm Dark Earth. Dig the hole, fill it with water and allow the soil around the hole to absorb the water. Add soil amendments or fertilizer as needed and fill the hole again with water, remove your young tomato plant from the pot and plant in the mud covering the stem with soil. Don’t worry if the plant appears to be lying on its side, and don’t try to bend it upright. Within a few days it will face the sun on its own. 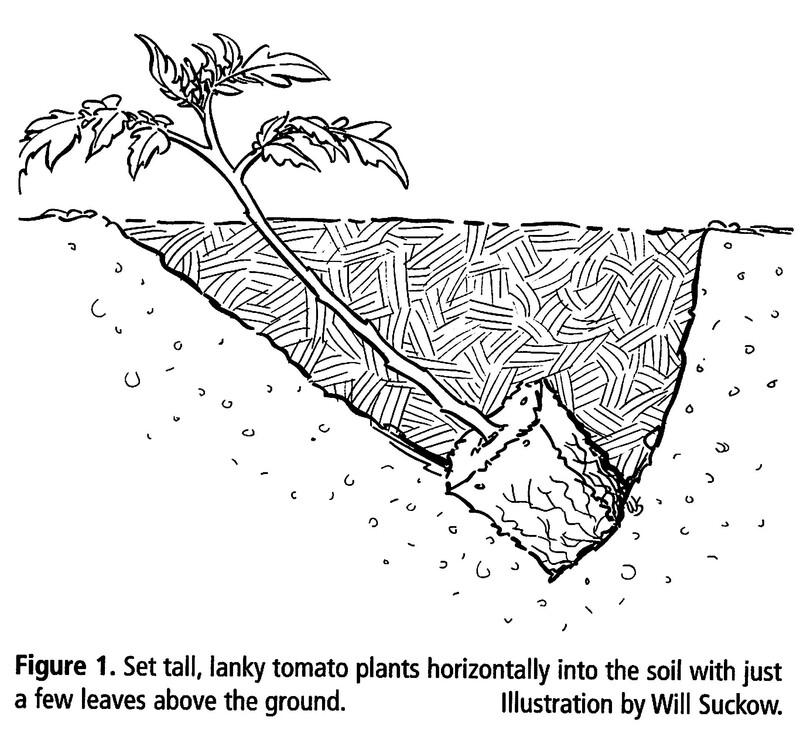 Most tomato plants can get BIG and they appreciate room to grow. Pruning (discussed in Part 5) can help control the size to some extent, but if you are growing a variety like Brandywine, they will not be contained to 2 feet high and still produce fruit. The rule of thumb is to give each plant 4 square feet. If you plant them too close, you will get less fruit produced on each plant. Tomatoes are vines and they need some support if you want them to grow vertically. Choose what is best for the mature size of your plants; cages, trellis, stakes, tee-pee, ladder, bridge, spiral, fence, basket weave or any combination. Put those supports in now, when you first plant the seedlings out into the garden. You do not want to break off stems trying to fit a cage over the plant 2 weeks from now. Tomatoes do benefit from mulch and it can make the garden look a little neater. But what type is best? Red plastic mulch warms the soil, suppresses weeds and encourages ripening but . . . looks . . . odd in the garden? Organic mulches look nice, maintain the moisture and can provide some nutrients but also can hide some pests like slugs. I love to plant dwarf white clover between my tomatoes as a green manure. It becomes a living mulch of soft green, fixes nitrogen to the soil, attracts bees (which can be an issue for some people) and suppresses weeds. Here is an example of Cabbages mulched with dwarf white clover. In the past my entire garden was permanently mulched with dwarf white cover.